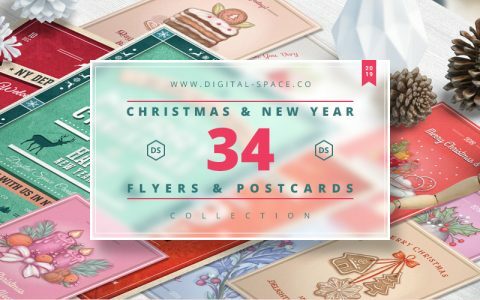 Breathe holiday happiness & joy with this cheerful collection of 34 Christmas & New Year Items - Flyers and Postcards. It includes cheerful festive elements that work together as a festive chorus of joyful artworks. It's a perfect match for your holiday season & winter projects. DealClub Members get it for FREE. Why Buy 34 Collection Of Christmas & New Year Items? This collection of Christmas & New Year Items features authentic retro style, bright colours and highly detailed graphics. Every item in this Collection is full of amazing details. Each detail is crafted with attention and care. And every single detail is beautiful on its own and is a joy to discover. The design mock-ups on this page such as frames images, wall images, table images etc. are provided for preview purposes only and are not included in the final download. These flyers and postcards are provided with our Regular royalty-free license. It means you can use them in your own projects or in projects for your clients. This can be used for both personal and commercial use. There are no limitations for a number of projects or for a number of print copies you create with these flyers and postcards. You can not massively resell or distribute for free PSD source files of these flyers and postcards as templates. Flyers, Postcards, Elements – A Complete Holiday Variety! It feels like finding a treasure trove of delightful design gifts under a Christmas tree! DealClub Member??? Get It For $9 FREE.!!! Very nice looking postcards. Love the commercial use freedom. 5 stars!